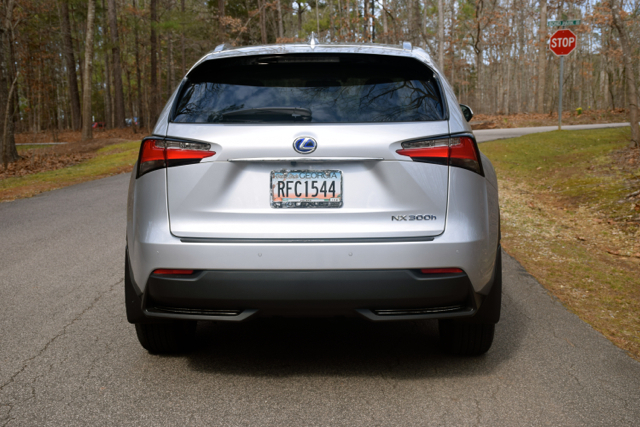 Compact NX is the smallest of four Lexus SUVs. 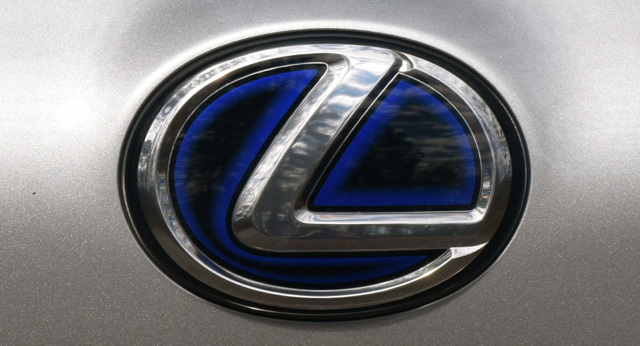 Low fuel prices haven’t halted Lexus’ advance in all things hybrid. Piggybacking on Toyota Motors’ technology, Lexus’ gas-electric vehicles currently number five model lines and soon will be joined by two 2018 models: the LC 500h coupe and the LS 500h. 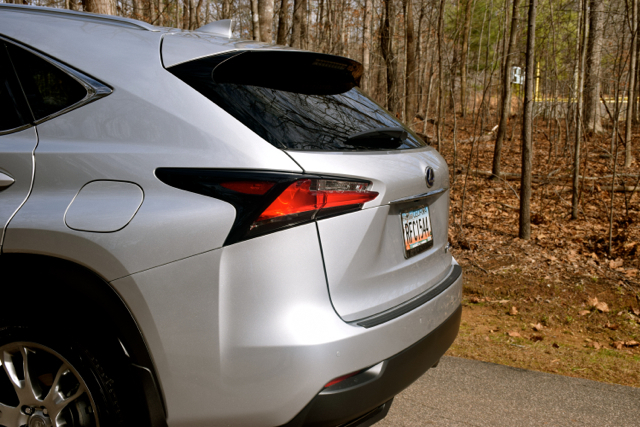 Of the current models, the Lexus NX 300h is the newest. Introduced in 2015 along with the Lexus NX Turbo, this compact SUV slots below the wildly popular midsize RX, the smallest of four SUVs offered by Toyota’s luxury brand. 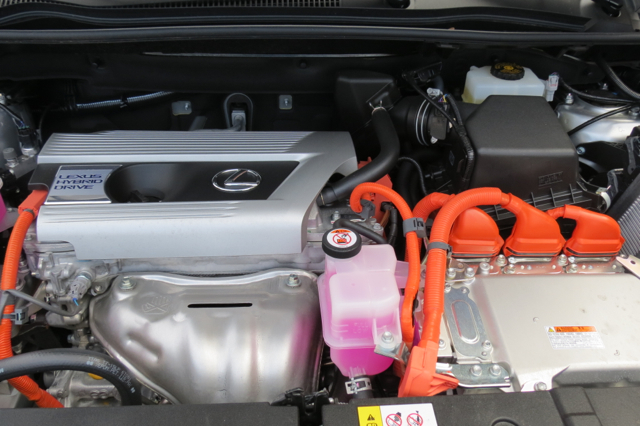 Where the NX Turbo relies upon a 2.0-liter, turbocharged four-cylinder engine with 235 horsepower and 258 pound-feet of torque to move this SUV, the NX Hybrid uses a normally aspirated 2.5-liter, four-cylinder engine and a pair of electric motors. One of the motors sends torque to the rear wheels when needed, so the NX Hybrid is standard all-wheel drive, while the gas NX offers front- and all-wheel drive choices. 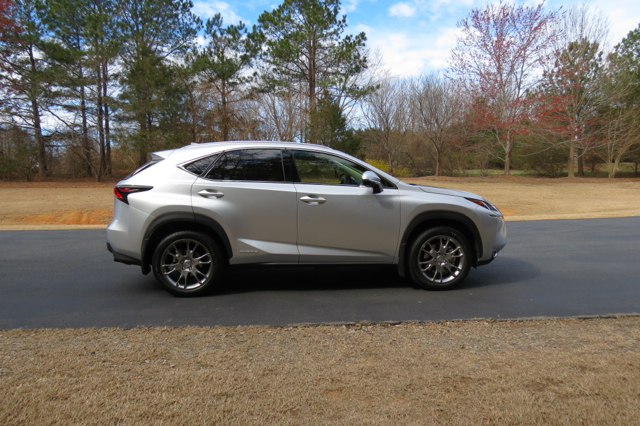 A recent weekly driver for Auto Trends Magazine was a 2017 Lexus NX Hybrid. 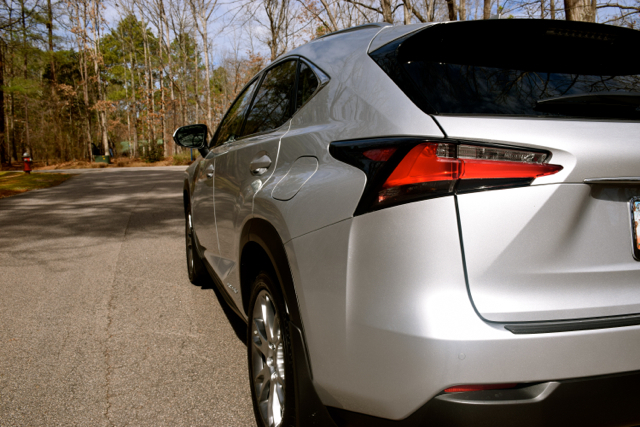 Although the NX Hybrid is a mono-spec (one trim) model, several packages are available. Indeed, my test model had a base price of $39,720 (plus $975) for destination, but $15,000 in upgrades. Those upgrades included a $4,545 luxury package — 18-inch wheels, a heated steering wheel, heated and ventilated front seats, LED daytime running lights, and a 10-way driver’s seat with lumbar support. 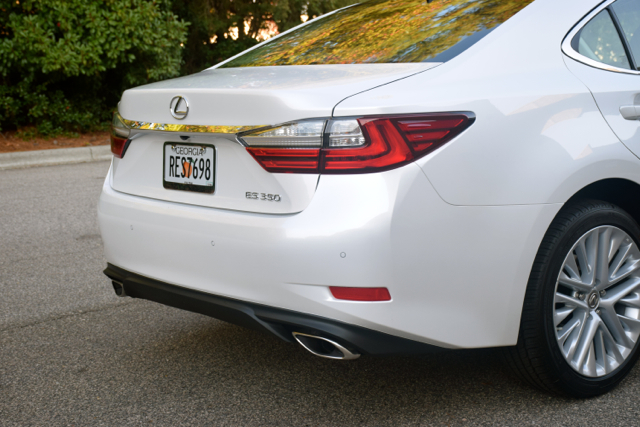 A $1,815 navigation package also brought in a 10-speaker premium Lexus audio system. Then, for $3,900, the luxury package was upgraded to 19-inch forged wheels. Other add-ons included a power-folding rear seat, parking assist, and safety features. There are a number of similarities as well as differences between the standard and hybrid models. both vehicles offer distinct styling cues marked by profound body sculpting, strong character lines, a rising belt line, and a flowing roofline. Some find the look polarizing — as if the designers went wild with a sculpting knife. Certainly, today’s Lexus style is much more evocative than ever before, playing an integral part in raising the brand’s profile. Yes, Lexus has heard that their designs were “boring” and has set out to do something about that. The result is evident, especially in the updated fascias, including the pronounced spindle grille. 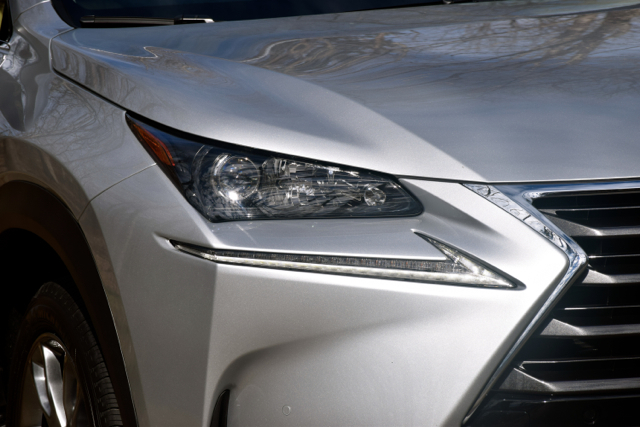 The NX’s spindle grille dominates the front fascia. But there is an important distinction between gas and hybrid models. Yes, the outline is the same, but the hybrid is marked by four distinct horizontal slats with a blue highlighted Lexus logo in the middle. 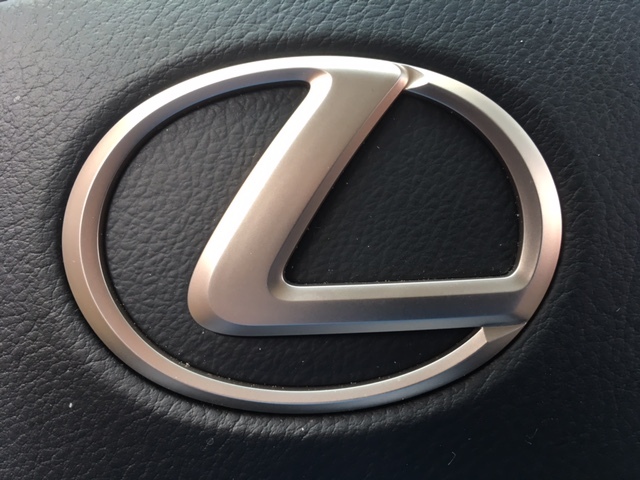 The gas model dispenses with the bars and employs a honey-combed design, itself marked by a black highlighted Lexus logo. Other standout features of both models include the L-shaped accent lights, sporty headlamps, a narrow lower grille opening, huge wheel arches, a rear spoiler, and wing-like rear combination lamps. Dual exhaust ports are also present. 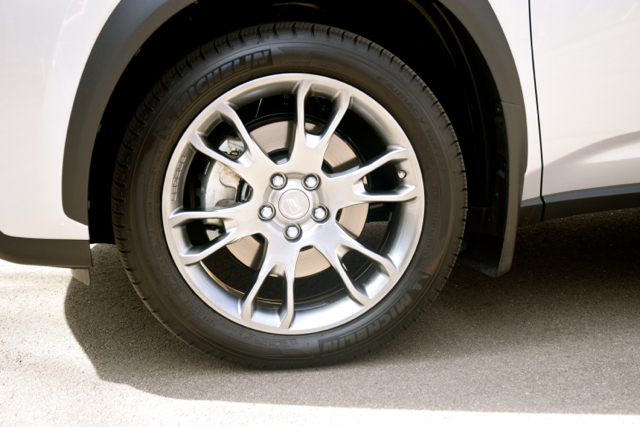 Wheel choices range in size from 17 to 19 inches, and include alloy wheels with both five- and 10-spoke designs. All-season tires are standard. 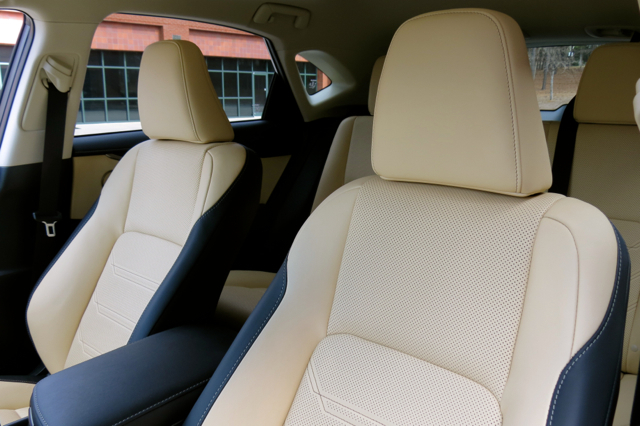 The Lexus NX seats five, although four is the ideal number. There is ample head, shoulder, hip and leg room up front. 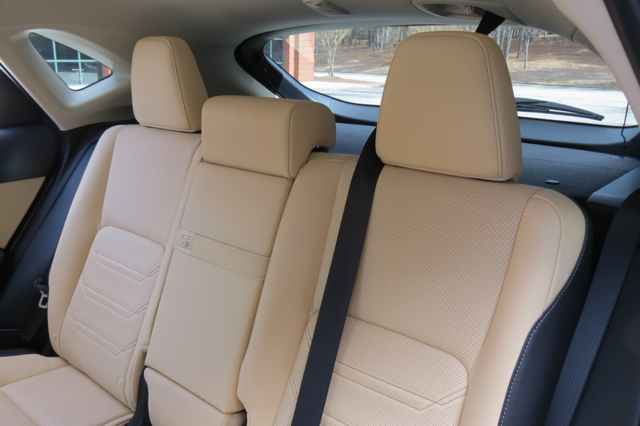 The rear seat is sufficient in all four categories, but can provide tight hip and shoulder room if someone is sitting in the middle position. Tall passengers may find the sloping roofline somewhat limiting, although the bulk of the slope occurs behind the rear seat. That said, you’ll find just 16.8 cubic feet of standard storage space. Fortunately, the battery pack is located beneath the rear seat and therefore doesn’t keep that seat from folding. And a good thing too: you’ll enjoy 53.7 cubic feet of storage space when the rear seat is folded. 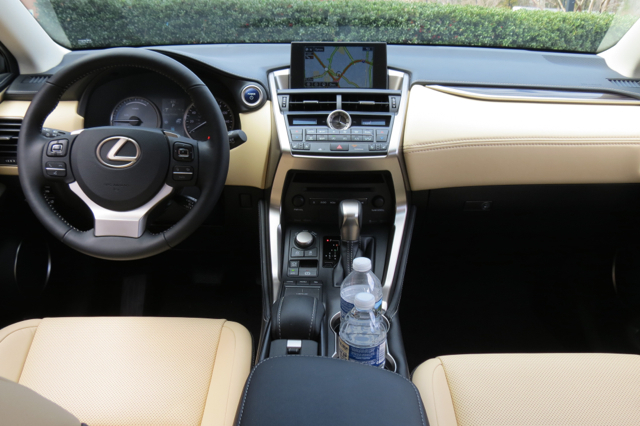 A modern interior graces the NX Hybrid, dressed in NuLuxe trim. NuLuxe has the look and feel of leather, but it isn’t the real thing. Leather seats are available, but don’t immediately dismiss the imitation material — it is one of the best I’ve seen (and felt) in the industry. As for the rest of the trim, opt for the luxury package if wood trim is your requirement. Here, you’ll find linear black shadow wood as an upgrade from the usual metallic trim. All models come with keyless entry with push-button start, dual-zone climate control, full power accessories, and a leather-trimmed steering wheel and shift knob. Individual options include heated front seats, power folding and reclining rear seats, a power moonroof, or heated and ventilated front seats. The front seats are very comfortable, the driver’s seat more so with the available 10-way power seat with lumbar support. 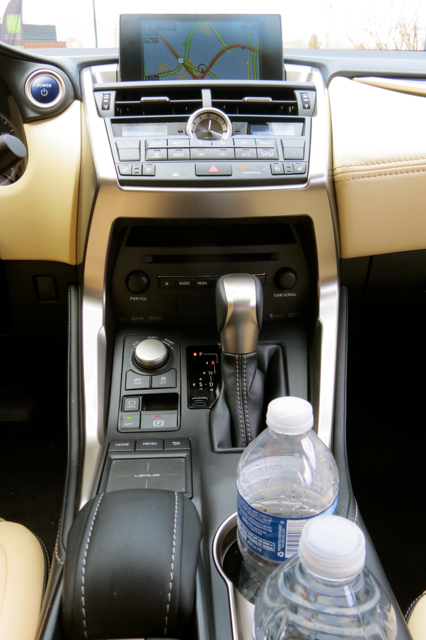 Kudos to Lexus for supplying a quiet interior and a comfortable ride. If you’re a fan of the RX Series, the NX will not disappoint. All Lexus NX models come with a generous list of safety features. 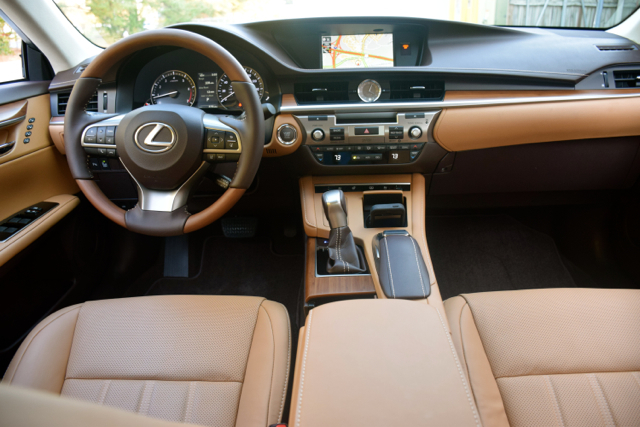 Eight standard airbags, a backup camera, Siri Eyes Free, stability control, and Lexus Enform Connect are included. You can also choose triple-beam LED headlamps, lane departure alert, blind spot monitor with rear cross traffic alert, parking assist, and a pre-collision system with radar cruise control. When it comes to safety ratings, the Insurance Institute for Highway Safety awarded the 2017 Lexus NX with its Top Safety Pick+ rating, its highest score. Similarly, both the NX 200t and NX 300h garnered top five-star scores from the National Highway Traffic Safety Administration (NHTSA). 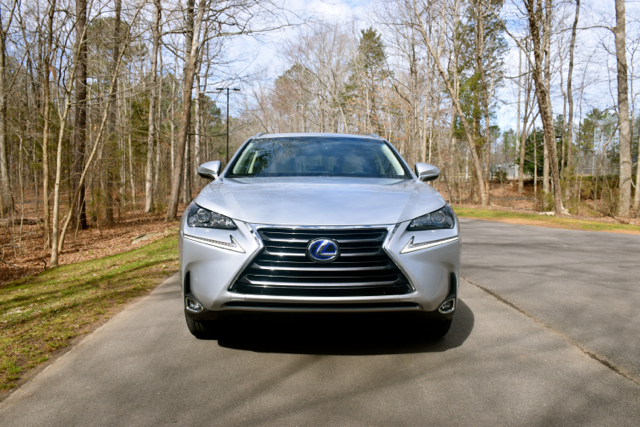 Technology and Lexus go hand in hand and the NX Hybrid delivers. You’ll find a full LCD color display in the instrument panel and you’ll also have Lexus’ touch pad to control the center stack color screen. That pad works much in the same way as a mouse. There is a learning curve present — my advice to new owners is to practice the pad while at home to avoid distractions on the road. When you grasp the system, you’ll manage the scratch pad with only minimal distraction. An eight-speaker Lexus premium sound system is present, but you can upgrade to a 10-speaker system. The expected tech features such as Bluetooth, USB connectivity, HD Radio, traffic and weather updates (subscription), and an auxiliary audio port are also present. A Qi-compatible wireless device charger is available — just remember to remove the cover from your smartphone, otherwise it won’t work for you. The NX Hybrid “rolls” differently than the gas model, using a hybrid propulsion system to get the work done. Where a six-speed automatic is paired with the gas model’s engine, Lexus employs an electronically controlled continuously variable transmission with the hybrid. You also have more horsepower to work with in the gas model — 235 hp v. 194 hp. Torque numbers are even more skewed toward the turbo — 258 pound-feet v. 152 pound-feet. Nevertheless, the hybrid delivers sufficient power when you need it. Furthermore, the NX Hybrid offers a distinct fuel efficiency advantage, delivering 33 mpg in the city and 30 mpg on the highway to the 22 mpg city and 28 mpg highway of the turbo model. Importantly, the hybrid has a 7 mpg overall edge to the gas model — 31 v. 24. For the uninformed, hybrids sometimes get a bad rap. Thought by some as generally weak alternatives to gas engines, hybrids do provide a lot of kick when you need it most — especially when passing. As for the NX Hybrid, its toughest assignment is battling the performance boost of the turbo. Quite frankly, there is no contest there. The turbo has an edge that can’t be overcome, namely a respectable 0-60 mph time of 7.2 seconds. As for the hybrid, a leisurely 9.1-second 0-60 mph time is offered. Again, you’re considering a hybrid for efficiency, not performance, so you’ll need to manage your expectations accordingly. Two things to consider about this hybrid, no *most* hybrids — uninvolved steering and squishy brakes. 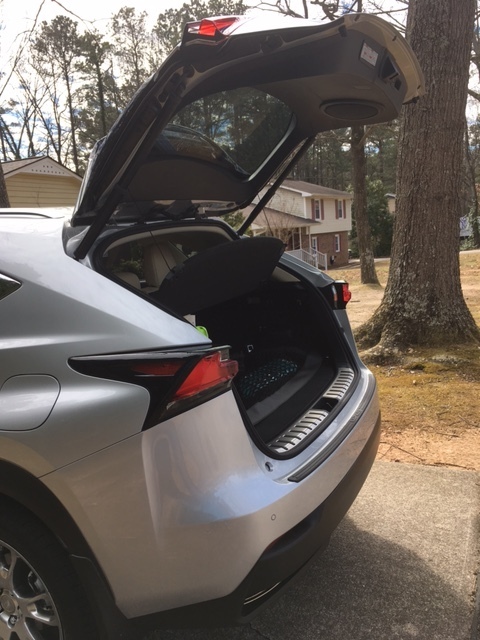 That’s something you’ll deal with the NX Hybrid, but it shouldn’t be a surprise either — the brakes not only stop the SUV, but send kinetic energy to the lithium-ion battery pack for use later. And if you’re someone who likes to tow, the NX Hybrid has a 1,500-pound towing capacity. Compare that to the 2,000-pound capacity of the NX 200t. Is the NX Hybrid the best choice for you? It could be although it starts about $4,500 more than the base NX 200t. But the hybrid is all-wheel drive, thus the gap narrows to $3,000 when comparing AWD to AWD. Still, if you’re looking to get your investment back with the hybrid, you may be disappointed. What the NX family does is to provide a sensible gateway to the Lexus brand. Several other models do likewise, including the compact CT hatchback, as well as the IS and ES sedans. All four can be had for under $40,000 and that means you can easily upgrade from Toyota or slide over from another luxury brand. The Lexus ES is a luxury sedan requiring no introduction. Now in its sixth generation, the ES line is one of two models that launched the Lexus brand in 1989 (the flagship LS is the other one) and remains Lexus’ top-selling model behind the RX SUV. The ES line has always represented a front-wheel drive model powered by a V6 engine. Only since 2013 has a hybrid 300h variant been offered, a surprising fact to some given that nearly every other Lexus line has offered a gas-electric hybrid. 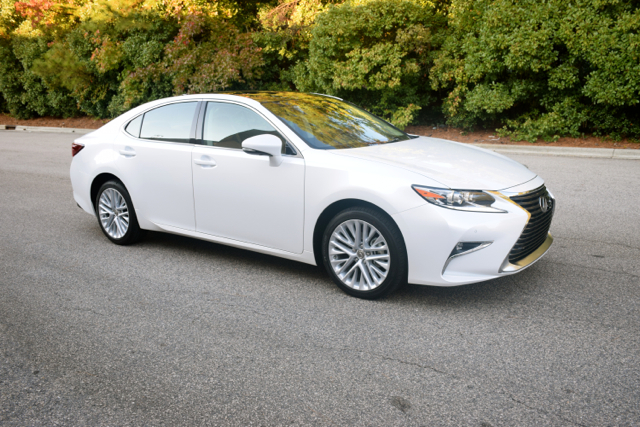 A 2017 Lexus ES 350 sedan was a recent weekly driver and there are several changes of note over last year. 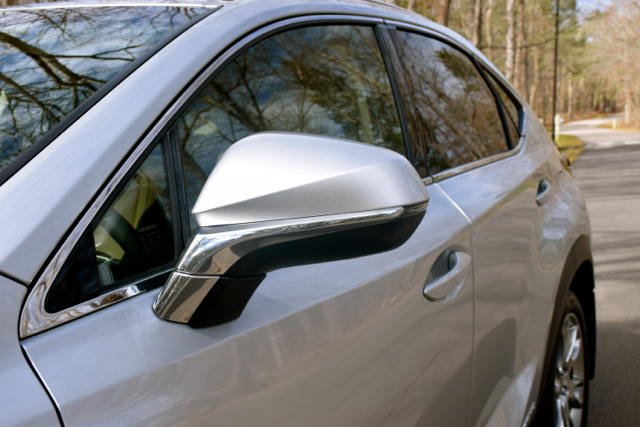 The standard equipment list now includes rain-sensing wipers and the Lexus Safety System+ package. The LSS+ features a pre-collision system, lane departure alert with steering assist, intelligent high beams, and radar cruise control. Also new for 2017 is the Scout GPS Link to its standard display audio system. Lexus says that with the app on the driver’s smartphone, navigation maps, and turn-by-turn directions appear on the car’s central display screen. As has been the case with previous ES models, this sedan typically garners attention from people familiar with the brand. Indeed, I’ve had friends, neighbors, and strangers ask me about the model and more than once they’ve said the ES is or would be their Lexus model of choice. That appeal meshes well with Lexus marketing as the ES remains one of the entry-point models for the brand. The ES 350 has the distinction of being the only Lexus model built in the US (the RX and RX Hybrid are built in Cambridge, Ontario). In 2015, Lexus shifted ES 350 production from Japan to its Erlanger, Kentucky, manufacturing plant. However, the hybrid variant is still built in Japan. Coinciding with the release of the current-generation model in 2013 is when the ES assumed its current design language. A refresh in 2016 only sharpened that look with a more distinctive spindle grille, new headlamps, and more pronounced embrasures for the fog lamps added. Standard equipment includes LED daytime running lights, halogen headlamps, LED low beam headlights, 17-inch alloy wheels, side mirrors with integrated turn signals, and dual exhaust tips. All models also come with a power tilt and slide moonroof. Factory options include 18-inch alloy wheels, Bi-LED headlamps with LED daytime running lights, fog lamps, automatic high beams, and a one-touch power trunk. The Lexus ES is classified as a midsize luxury sedan, but it seems larger than that. This model seats five in comfort with generous amounts of head, shoulder, hip, and leg room all around. This is where the sedan’s front-wheel drive layout works to the advantage of the ES — no big drivetrain hump interferes with leg space. Plush and supportive bucket seats with 10-way power support are found up front. 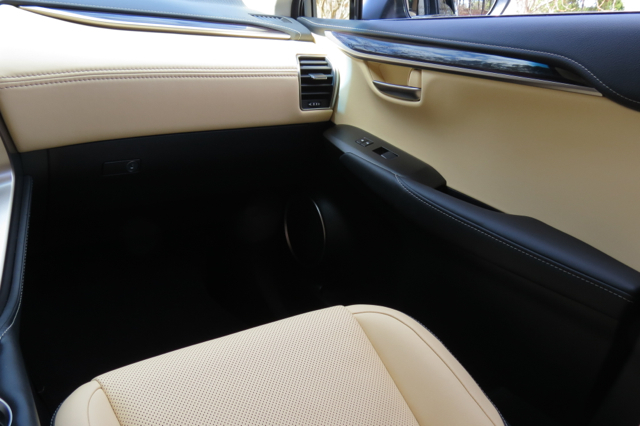 A three-place bench seat is in the second row with a pass-through to the trunk. By the way, the trunk measures 15.2 cubic feet or about average for this segment. 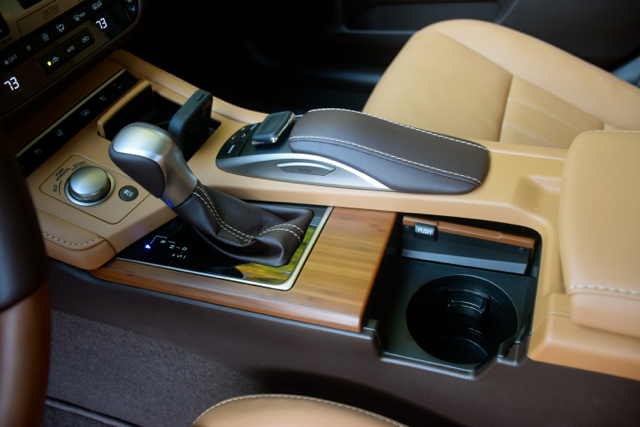 Standard equipment includes full power accessories; leather or imitation leather (NuLuxe) seats; wood, imitation leather, and piano black trim; an analog clock; personal lamps, puddle lights; and zoned climate control. This model also comes with a remote touch controller, a mouse-like device for controlling audio and navigation. All models are outfitted with an eight-inch touchscreen display and are compatible with Siri Eyes Free. A rearview monitor, an eight-speaker audio system, CD player, HD Radio, satellite radio, Bluetooth connectivity, and USB and auxiliary ports are included. Lexus Enform is included with the available navigation system and brings in apps, safety features including automatic collision notification, and remote access via your smartphone. Crash test results are pending for the 2017 model. The 2016 edition was an Insurance Institute for Highway Safety (IIHS) Top Safety Pick+ recipient. With the Lexus Safety System+ package now standard, we expect the 2017 ES will retain its top safety billing once again. Lexus doesn’t mess with success when it comes to the ES powertrain. A 3.5-liter V6 engine making 268 horsepower and 248 pound-feet of torque is paired with a six-speed automatic transmission. No forced induction. No eight-speed transmission. And no optional all-wheel drive. But with a curb weight of just 3,571 pounds, the ES is surprisingly lightweight and certainly well-suited to move the sedan. Car and Driver recorded a 0-60 mph time of just 5.8 seconds for the 2015 model, a number that comes in much lower than the 7.1 seconds time offered by Lexus. Figure your numbers will fall somewhere in the middle. Stomp on the accelerator and the ES quickly comes to life. You’ll feel a slight tug of the steering wheel, but torque steer isn’t a significant issue. This sedan zips down the freeway entrance ramp with authority. When passing on the highway you’ll have just the right amount of power to squeeze past that semi. The transmission shifts seamlessly between gears and that’s everything you should expect in the ES. 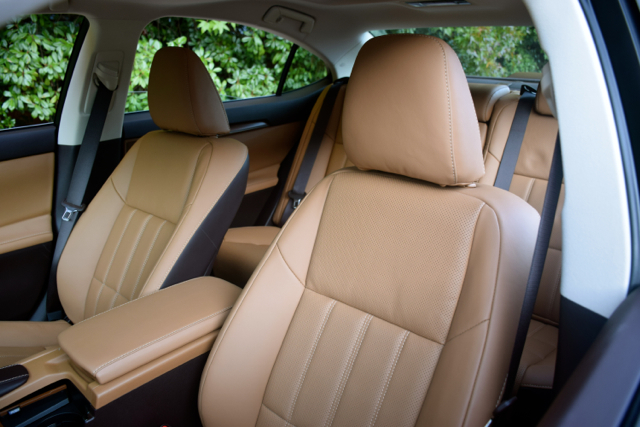 The Lexus ES is tuned for the road, offering a quiet interior and a soft ride. The drive mode select feature can be dialed to the level of comfort that suits you best — eco, normal or sport. You’ll want to choose the latter for at least some level of driving feedback, otherwise don’t expect much engagement. The 2017 ES 350 starts at $38,900; the 300h is priced from $41,820. The hybrid averages 40 mpg, an outstanding number for a vehicle of this size. Choose the ES and you’ll get 24 mpg. That 16 mpg difference is attained in part by the 2.5-liter four cylinder engine found in the hybrid along with the hybrid drivetrain. If you are seriously considering the 300h, you need to determine whether the reduced level of power in the hybrid is fine for you — there is no escaping the fact that a performance difference is present — 200 hp v. 268 hp. On the other hand, the high mpg potential with the 300h is certainly attractive. Both models are mono-spec — one trim level. However, package upgrades allow for further customization. Our test model came with two, including luxury ($1,670) — composed of heated and ventilated front seats, a heated steering wheel, power rear sunshade — and a navigation system with the Mark Levinson audio package ($2,590). Individual options include such amenities as a heated wood and leather steering wheel ($450), panorama glass roof with power moonroof ($500), upgraded 18-inch wheels ($880), blind spot monitor with rear cross-traffic alert ($500), and LED headlamps ($515). Quite easily, you can add upwards of $10,000 to your final price by claiming every package and choosing most options. If you’re looking for the performance side of the Lexus sedan range, check out the compact IS and the slightly larger GS lines. Both models offer standard rear-wheel drive, available all-wheel drive and turbo options. Of course, if it is simply a matter of getting your first Lexus, the CT200h (hybrid), NX200 (SUV), and the IS lines are other places to start. 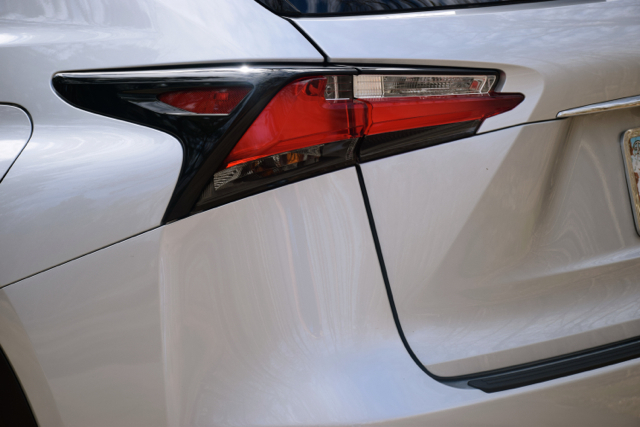 In all, the Lexus ES provides what the vast majority of luxury shoppers want — a comfortable, well-equipped sedan with high-quality materials, superior fit and finish, and a reliability record second to none. 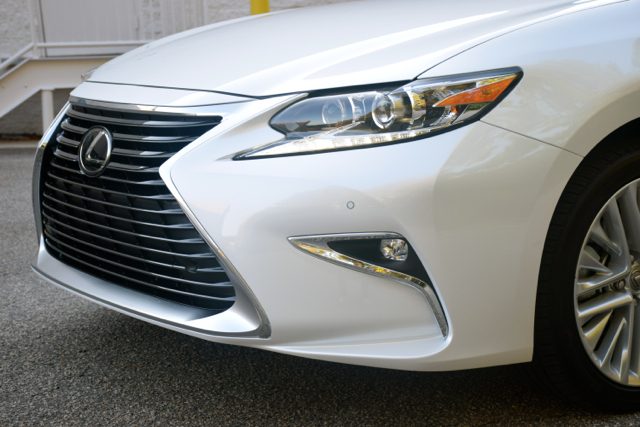 You get all this in more in the Lexus ES — your only dilemma is whether to go with the gas or hybrid model.